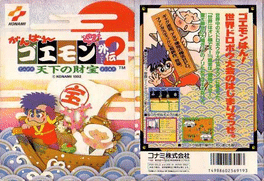 Ganbare Goemon Gaiden 2: Tenka no Zaihou is a Role-Playing game, developed and published by Konami, which was released in Japan in 1992. This game is the first title that really defined the Goemon (Legend of the Mystical Ninja) series. It is a virtual atmosphere of a Japan where every myth and legend that ever came to exist are brought to life in this game, be it amazing clockwork machinery, Ice spirits that are out to haunt the player, or a trip down to hell for harming the Ojisan statues.